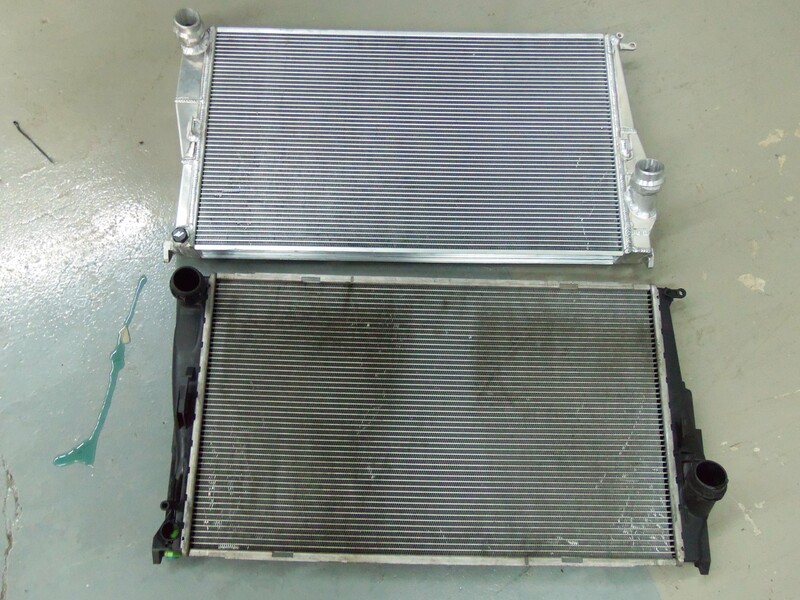 Interested in purchasing this E90 radiator? Check out our product page for more information! Finally, we made it to our day of testing! 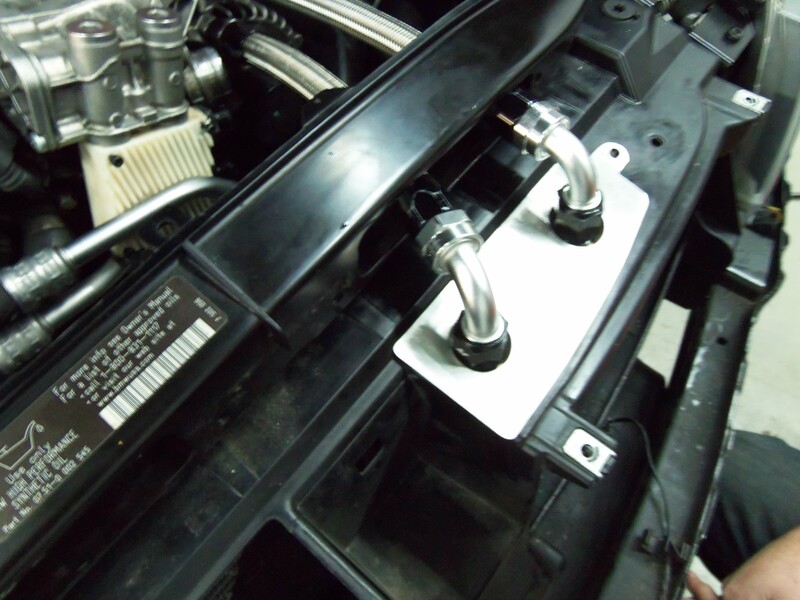 We had previously confirmed fitment and made a few minor adjustments to some external end-tank features to improve coolant flow and ease of installation. 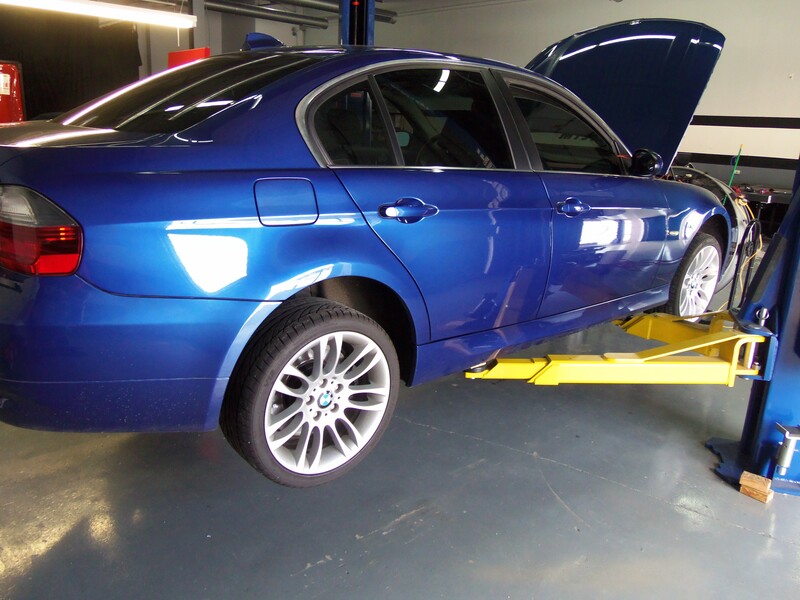 A member of E90post was kind enough to lend us his vehicle for this round of testing. 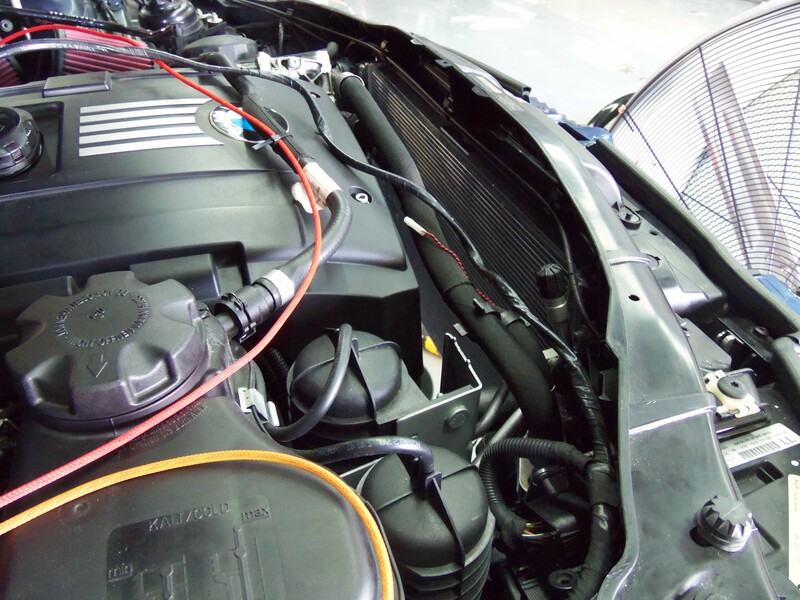 This 2007 sedan was equipped with a manual transmission, JB4 software and an intake. This vehicle would be ideal for collecting testing data, we have found that the “Average” E9X owner has similar modifications. First, we needed to remove the factory unit and replace it with the Mishimoto radiator. We would be testing our unit first followed by the OEM radiator. Our main goal here was to gather comparisons of several features of the radiator as well as temperature data. 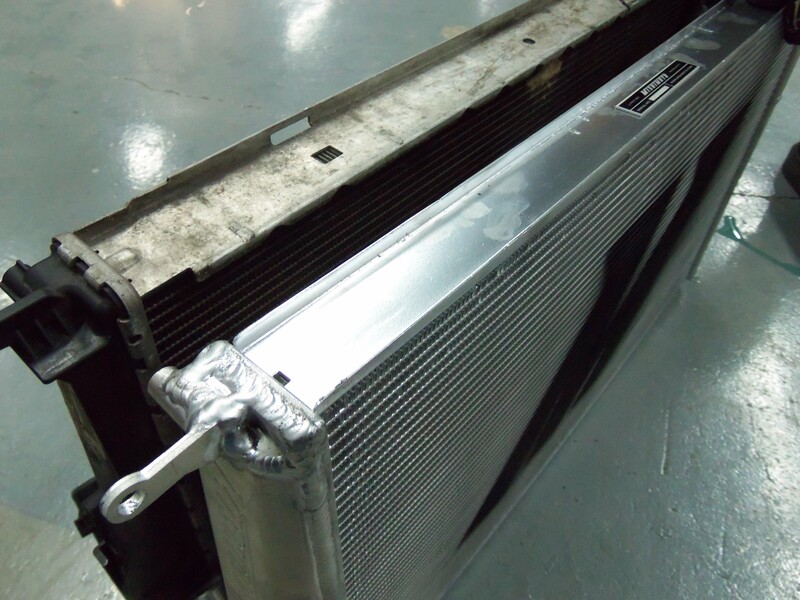 Check out a few shots of the Mishimoto unit next to the factory radiator we removed. 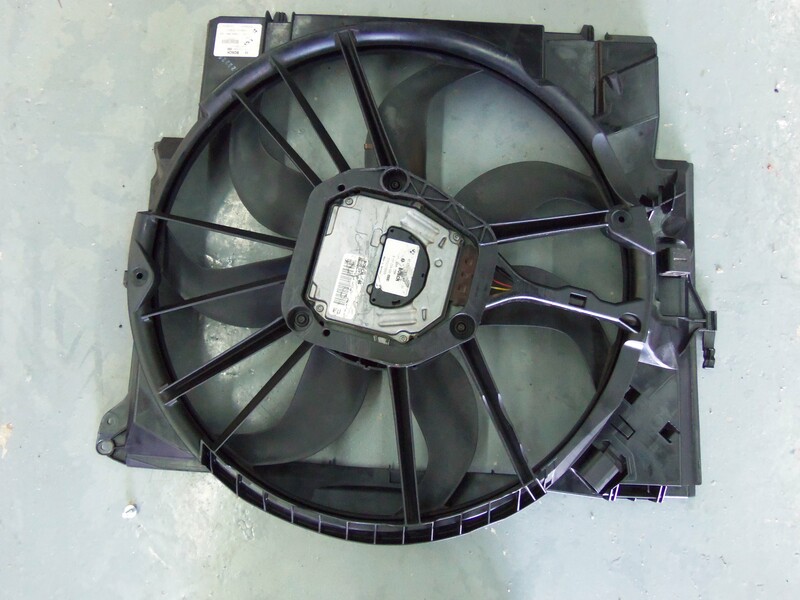 It is nice to see a BMW with an electric fan, no more antiquated mechanical fan! Another shot of the stock radiator. It seems this one has built up some fin debris. The vehicle owner is certainly driving his car! This debris will have an effect on cooling performance and heat transfer, it may be wise to check yours out every now and again to be sure buildup is not excessive. Once we had the old unit out, the Mishimoto radiator was installed. All of the adjustments we made to the previous prototype were a success and this unit fit like a glove. Check out the Mishimoto radiator in its new home. 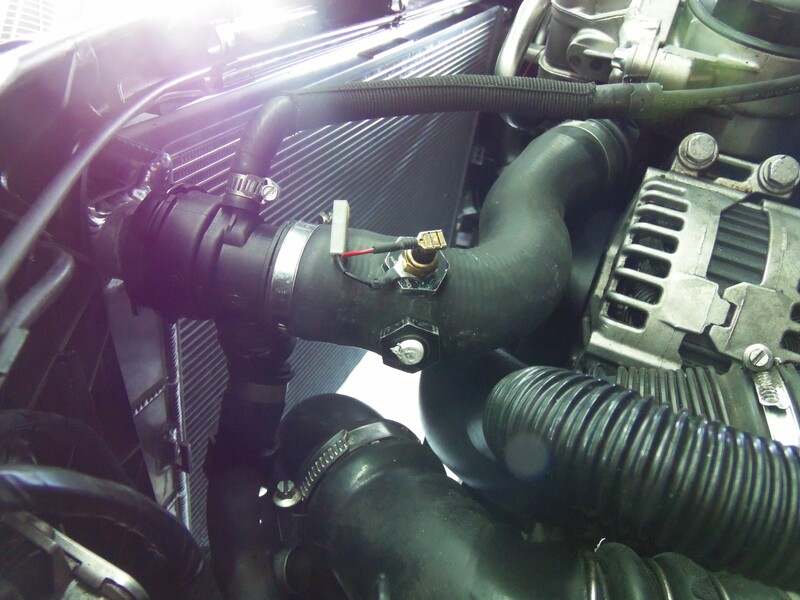 And finally we could tap the factory hoses for our sensor bungs and install our testing equipment. 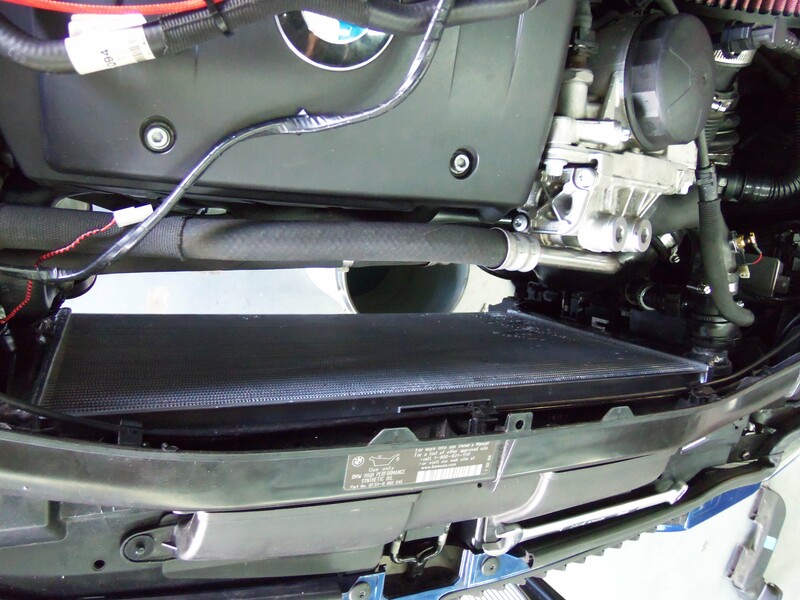 Now first, let’s cover the physical specs of the Mishimoto radiator compared to the factory unit. A few more additional points of important information in regards to cooling efficiency and heat transfer. At this point it was time to review our temperature data comparisons from the stock radiator to the Mishimoto unit. This is where things become tricky for a variety of reasons. We are completely transparent regarding our testing processes as well as our results, nothing has been skewed in any way to improve the appearance/value of our products. After reviewing the data, we came to the conclusion that the inlet and outlet temperatures of both radiators were nearly identical. This may be shocking based on the specs listed above, but a few things regarding testing conditions need to be considered. Ambient Temperature: Our data collection was compiled with ambient temperatures in the low 70°F range. This is not ideal for recording coolant temperatures in an extreme manner. Preferably we would perform this test at a minimum of 85°F to see the result of this on heat transfer. Testing Process: Keep in mind the vehicle we are using is being loaned by an enthusiast. All of our driving (off the dyno) is performed in a normal manner and on public streets. 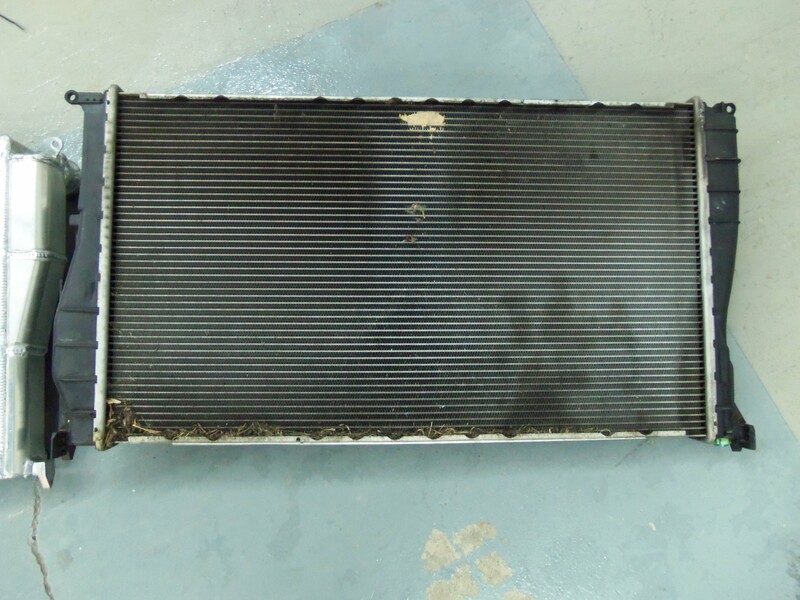 This places far less stress on the radiator and cooling system, which certainly effected our results. For this particular test we drove on the highway for five minutes with each radiator at a set speed of 65 mph with a clear path of air in front of the vehicle. This testing is not exactly capturing the capabilities of a performance radiator. Ideally we would have a test track, our own vehicle, and we could really put the car through its paces to see what the effects would be on temperatures. These factors all played an important role in the data we collected. We are not making excuses for the performance, just providing an educated explanation of what is happening. 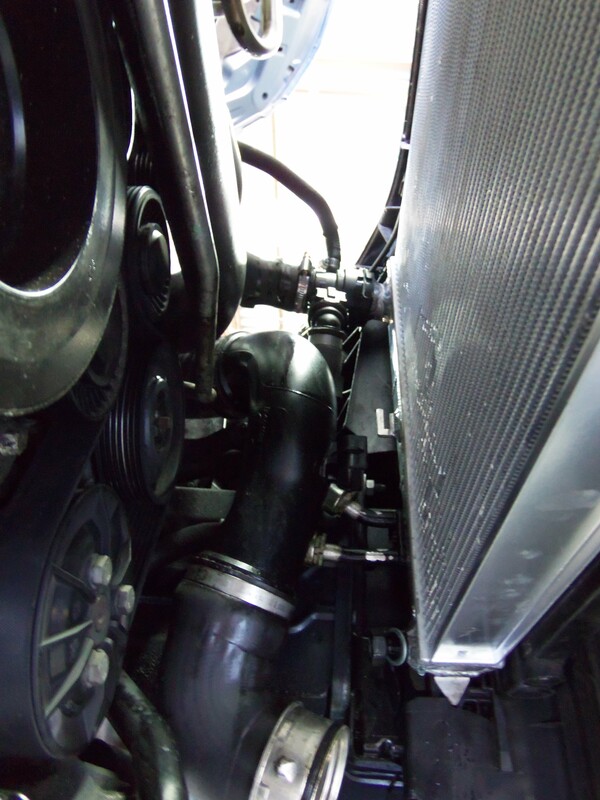 With our radiators capacity increase, surface area increase, and heat transfer improvement we are 100% confident that this radiator will outperform the stock radiator in both a warm climate and during aggressive driving. Our plan is to circle-back to this testing during the summer (Temperatures should hit the 90’s) and see the effect on our data. Additionally, if anyone would like to volunteer their time to test this product on the track, we would be very pleased to discuss setting that up. 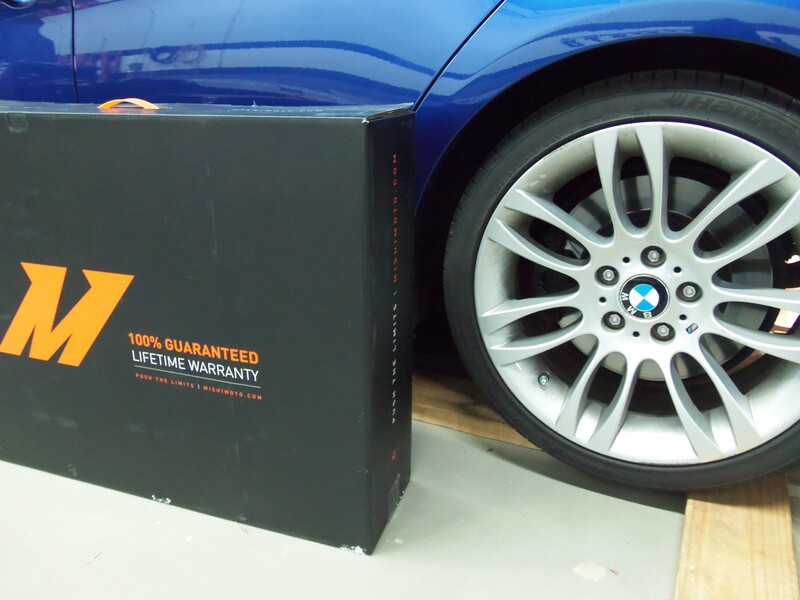 We performed similar testing on our new E46 M3 radiator. Our team designed a fantastic product and flew down to Orlando over the winter for track testing in a warm environment. 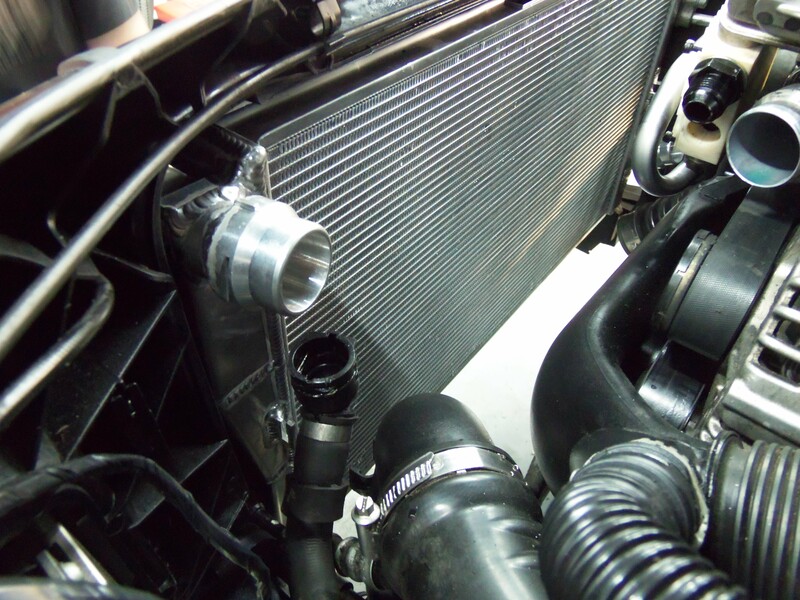 Check out the details here: BMW E46 M3 Radiator Thread. As of now, we are confident with the specs and performance of this radiator design and will be moving forward with mass production. We will have a better idea of release date and pricing within the coming weeks. 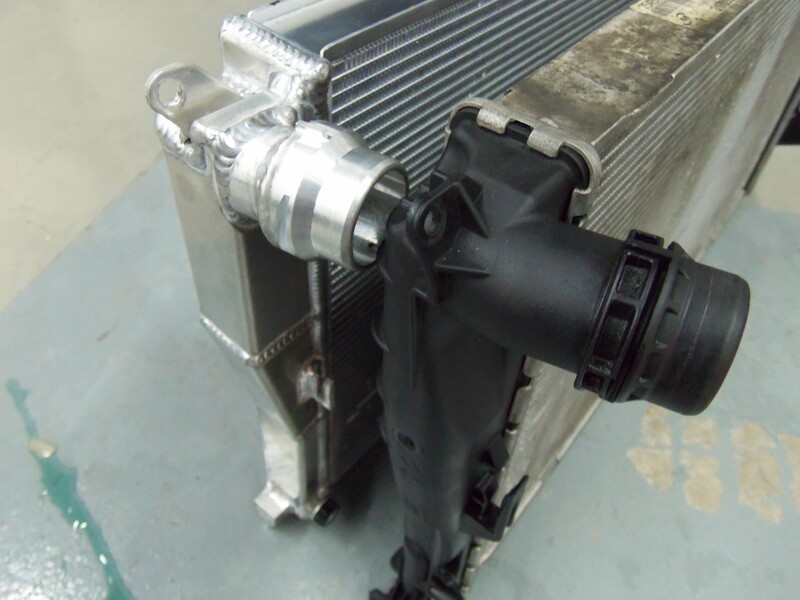 Along with our radiator testing during this particular week, we also began development of an oil cooler setup for the E9X. Check out this teaser shot! Thanks for following along! Feel free to follow-up with any questions. The car , E90 used to fit the radiator is Manual or Auto transmision?? ?